Dr. Kannan, of the Division of Environmental Health Sciences, is recognized as the 2017 recipient of the Lawrence S. Sturman Excellence in Research Award for his profound impact and contribution to the field of biomonitoring and environmental exposure assessment. A most highly cited researcher in the environmental field, and internationally recognized for his pioneering work in environmental health, Dr. Kannan joined the Wadsworth Center 15 years ago. He was the first to discover perfluorochemicals in the global environment. His 2001 article on perfluorochemicals, measuring PFOA and PFOS in polar bears and penguins, has been cited over 1,700 times (Environ. Sci. Technol., 2001, 35, 1339-1342). It is one thing for chemicals to be present in the environment, but it’s another for those chemicals to be present in the body. Biomonitoring detects which and how much of each chemical ends up in our body by looking for them and their metabolic products in our blood, urine and other tissues. Dr. Kannan has devoted his entire career to doing just this, and in the process has become one of the world’s top experts in this field. Dr. Kannan’s passion for the assessment of human exposure to toxic chemicals began more than 25 years ago during his doctoral research on contamination by pesticides and polychlorinated biphenyls in foodstuffs in Asia-Pacific countries. At that time, little was known about chemical contamination in foods in developing countries and his work presented a critical piece of information, advancing the global treaty on persistent organic pollutants (POPs). Evidence of the profound impact of Dr. Kannan’s work can be found in the volume, over 550, and breadth of the research articles he published. The populations studied, the elderly, women and children, are as varied as the sample types, food, water, air, urine, blood, breast milk, seminal fluid, and other tissues, and the chemicals detected, pesticides, industrial chemicals, pharmaceuticals, perfluoroalkyl substances (PFAS), phthalates and bisphenol A (BPA), to name a few. Dr. Sturman, Wadsworth Center's Director Emeritus (left), presents the Lawrence S. Sturman Excellence in Research Award, established in 2012 to recognize outstanding achievement among the Wadsworth Center community of biological or environmental scientists, to Dr. Kurunthachalam Kannan (right). 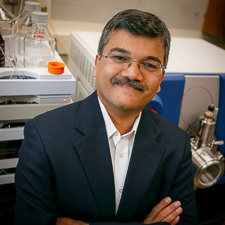 Dr. Kannan’s research has led to several discoveries. His group was the first to discover immunosuppressive butyltin compounds in marine mammals. Later, he found that humans are exposed to high levels of butyltins from seafood consumption and ingestion of indoor dust. His group was the first to discover bisphenol alternatives in urine, breast milk and adipose tissues. His recent study on bisphenols in baby teethers received considerable attention. Some results might be surprising. Dr. Kannan and collaborators were the first to associate improved performance of certain neuropsychological tasks with increased perfluorooctanoic acid (PFOA) levels in older adults; while at the same time, it was linked to certain cancers. Dr. Kannan’s group reported that estrogenic chemicals, present in cosmetics, increase the risk of developing endometriosis; while they also found that urinary phytoestrogen (plant-derived estrogen) levels in the same population are not linked to endometriosis. Dr. Kannan’s biomonitoring determined that contaminants can be detected and the biological impact felt long after exposure. He recently detected perfluoroalkyl substances (PFAS) in children living and attending school near the World Trade Center (WTC). Earlier, he demonstrated elevated exposure to dioxins and furans in adults responding to the WTC disaster. Lately, much of his work has focused on biomonitoring for the presence of phthalates, bisphenol alternatives, and other emerging environmental chemicals. Phthalates represent an entire family of chemicals that are present in personal care products, and therefore are absorbed through the skin; in the packaging of our food and drugs, and therefore are ingested; and even in the air we breathe. While the exact biological effect of phthalates still isn’t known for sure, it is thought that they damage DNA through oxidative stress. Exposure has been linked to insulin resistance, poor reproductive performance and outcomes, and vascular conditions, among others. His current research is focused mainly on infants and children. In some of the populations studied, phthalate levels had never previously been assessed. Dr. Kannan has developed methods to measure a wide range of environmental toxicants in blood collected and dried on filter paper. His laboratory is one of a very few in the country capable of measuring toxicants in such samples. He is planning to focus future research in the area of exposomics (how lifetime exposure impacts health) and on early life stage exposures (infants and children) and their health effects later in life.